Backup Software, Backup Program, Backup Manager, Backup System, Data Safe Keeping! When it comes to your data we realize that it is one of your most valuable business/personal asset. We are now in the paperless age where your information is stored only on a computer instead of on paper. That is why having a backup for safe keeping should be a high priority when it comes to protecting your data. Our software is a very quick, straight forward, easy to use program that allows you to back up your files for safe keeping. You can have it perform a full daily backup or any file that has been added or modified. EZ-Backup software performs a straight file copy from point A to point B. You won't need any special recovery software. It will also save a summary and optional detailed log file with a list of what was backup. Whether it be database files, word documents, excel spreadsheets, your family picture library, your college work, or other business related documents, EZ-Backup will backup it all up for you. Easily selects files and folders to include in your backup. Creates summary and detailed logs of backup process. 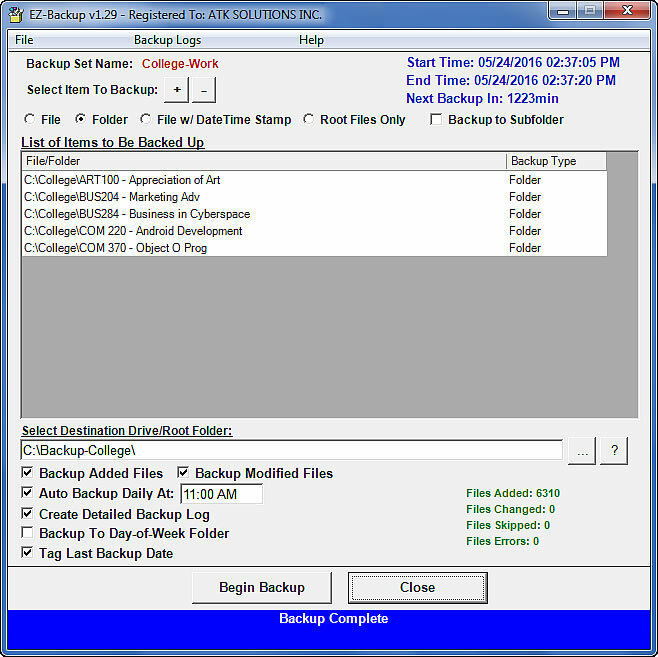 Ability to do a full backup or changed file backup. Maintains same folder structure on destination drive. Simple copy file from point-A to point-B. Keeps the same folder structure as on your hard disk. Doesn't create one big backup file, replicates copy. 2nd time you backup will be much faster. Option to backup at a specific time each day. Reports successful, changed, skipped and errors. Ability to create multiple backup profiles. Whether it be database files, word documents, excel spreadsheets, your family picture library, your college work, or other business related documents, EZ-Backup will backup it all up for you and you can know it worked correctly by simply checking your backup drive.